Drum sticks are becoming one of our new go-to purchases at the grocery store. My reasoning behind this simply due to the fact that they are so incredibly delicious, but also, I will admit that it is because they are fairly inexpensive. Sure, you pay for the bone, but they are so yummy! The way that my husband marinated and cooked these Honey Sriracha Drum Sticks is out of this world. I would argue that we could have each put back about…..10 of these! 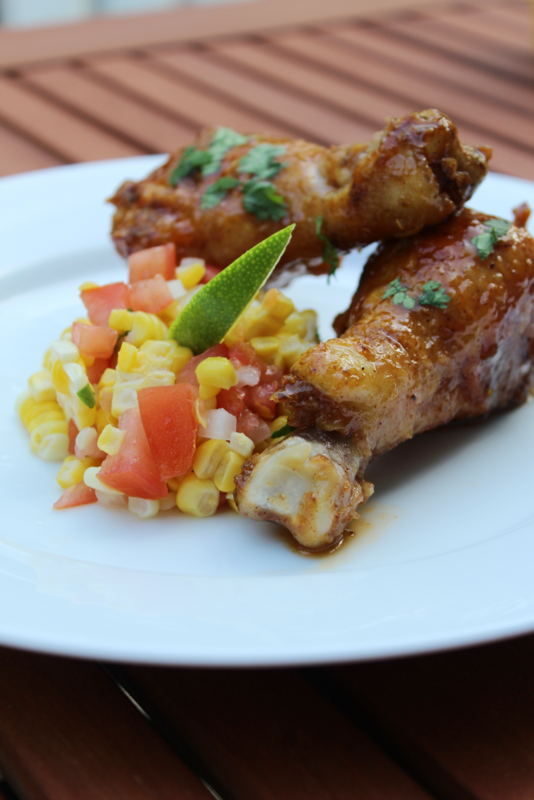 While the Honey Sriracha Drum Sticks were a stand out part of this dish, we can not forget about the salsa that sits next to them on the plate. This homemade Corn Salsa is one of our favorite summer side dishes. The combination of the fresh vegetables with the lime juice and cilantro is just priceless. I was so impressed by the way that these two parts of the dish complimented each other. 2. In a large zip lock, coat the drum sticks in the flour along with all of the seasonings listed in the ingredients (black pepper, red pepper, garlic powder, onion powder, salt, and paprika). 3. Remove the drum sticks from the zip lock bag and place on a lined baking sheet and place in the oven. You want to cook them for 30 minutes, take them out and flip them over and cook for another 30 minutes. 4. While the drum sticks are cooking, it is time to make the sauce reduction! In a small sauce pan, you will add the butter, honey, and Sriracha. Bring to a boil, and then turn to simmer while stirring constantly for 10 minutes. 5. 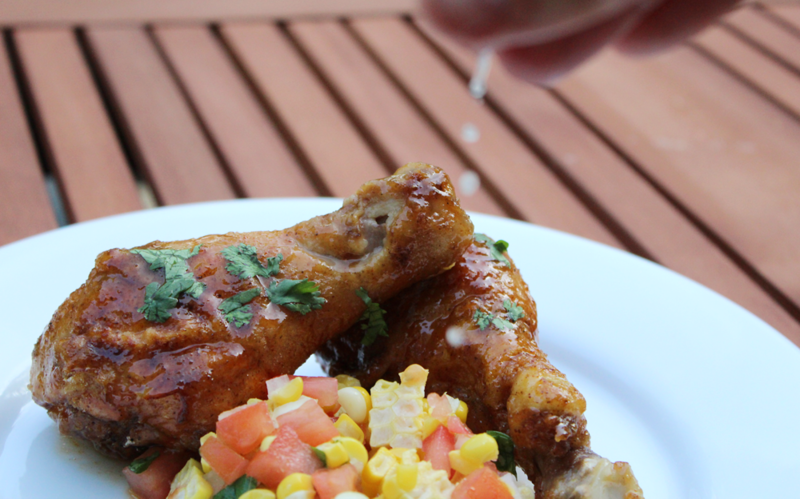 Once the drumsticks are done baking, drizzle your sauce over each piece, flip, and repeat. Let them sit for 2-3 minutes to let the sauce cool a bit. It will get all sticky and delicious! 1. Using a knife, cut the corn off the cob. 2. Add the corn, tomatoes, and white onion to a bowl. 3. Squeeze on the lime juice and toss. Do the same with the cilantro.